I have to say I’ve had a rather good week. It started with an excellent workshop with Sue Moorcroft over in Derby where I had the opportunity to meet some fabulous folks and gain some very useful insights and ideas from Sue. Also hats off to Derby Central Library for hosting. It was the second event I’ve been to which has been hosted by Derby libraries, the other was the workshop with David Hewson back in June which was thoroughly enjoyable. I think what struck me most was how accessible and eager to help both these highly successful people were and in this day and age that is very heart-warming indeed. 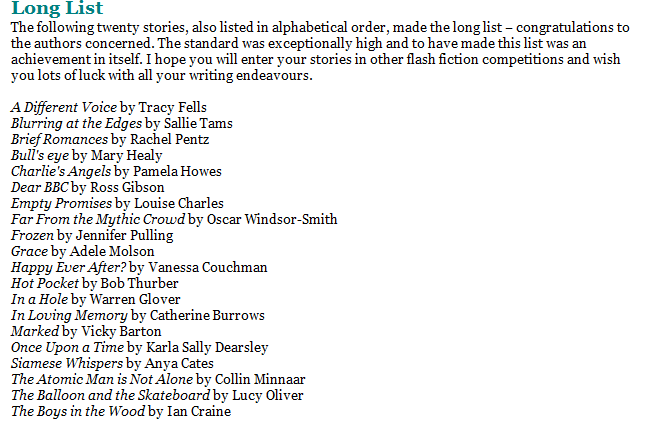 One of my stories won a competition which is a thrill and another made the Flash500 long list which was definitely very pleasing even though I didn’t make the short-list. The third piece of good news will have to wait a little longer before I can talk about it, all I can say is that it is the result of something which took me right out to the edge of my comfort zone and maybe a little further than that. It was also the result of a helpful nudge by a writer I admire greatly and it brought it home to me just how important it is for writers to help and encourage each other. Where else would it come from if not from each other? Friends and family are brilliant without doubt, but for me at any rate, only another writer can truly understand the angst and isolation we all put ourselves through. I’m just about to take my first break from work this year and I can tell you I sorely need it. I need some time to recharge and refocus on my creative writing. I’m heading into Shropshire on Monday for my week at the Arvon and I really can’t wait. The winner is Kirsty! Kirsty – ping me a mailing address on eleventhjacinth at gmail dot com and I’ll get it in the mail to you before I head for the lovely Shropshire hills. Fear not though, because I’m in such a softy and would love to have given everybody a copy, I will have another giveaway coming soon. I’m waiting for the item in question to be delivered before announcing it but I know you’ll like it! I will give you plenty of warning when that one is about to start. Before I go, if you are in the market for a good read on an iPhone. Check out this marvellous App by Ether Books. Here’s an article from the Guardian to help you decide and if you’re a short story writer they are open to submissions right now. Check out what Jonathan Pinnock has to say about it and also a very helpful article over at Bubblecow. I’m going to leave you with a little challenge this week. I wish I’d written this. It’s a piece quoted by David Hewson on his blog a while back and it comes from an introduction by Christopher Morley to an anthology of Sherlock Holmes stories. Thank You (and your hubby) so much. Looking foward to reading it.